One of the main life cycle stages a startup will experience is the business growth stage. A business usually seeks to grow to gain economies of scale or to reduce risk. Ultimately the aim for any business is to grow, become more profitable, and increase the return on investment to shareholders. Business growth, which in this context usually refers to sales growth, can either be internal or external growth. Internal business growth sometimes referred to as organic growth, occurs when a business seeks to increase its sales by either promoting existing products or by launching new products. The business retains its existing structure and management. External business growth occurs when the business joins together with another business either by merger or acquisition to form a larger business. A merger occurs when the two business agree to join together to form a new business operation. In the example Business A wants to grow and merges with another Business B. Together they form a new larger operation Business C.
An acquisition or takeover occurs when one business takes over the other business. The business taken over becomes part of the acquiring business and its identity is lost. A takeover can be friendly or hostile depending on whether or not the business being taken over agrees with the takeover or not. In this example Business A wants to grow by acquiring another Business B. After acquisition business A is still in operation and is now much larger and Business B disappears. Irrespective of whether Business A chooses to merge with or acquire Business B the type of integration will generally fall into one of two categories either vertical integration or horizontal integration. Vertical integration occurs when a business merges with or acquires another business at a different position in its supply chain. For example if our business is an oil refinery it is one link in a supply chain which includes among other things businesses which explore and drill for oil (oil well), refine oil (refinery) and finally distribute and sell the oil and gas to consumers (gas station). In vertical integration the business chooses to try and dominate and take all the profit from the supply chain. In this example the refinery business can move upstream (towards the start of the supply chain) and acquire an oil well to secure supplies for the refinery. This process is referred to as backward vertical integration. 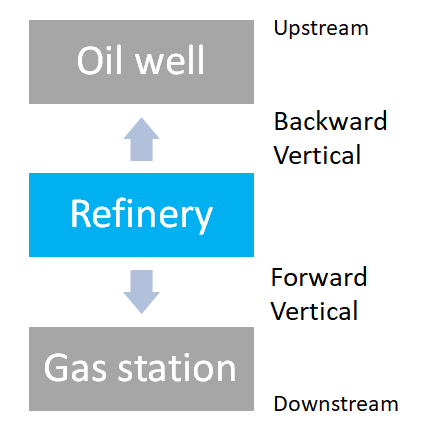 Alternatively the refinery business could also move downstream (towards the end of the supply chain) and acquire a gas station selling its refinery products direct to consumers, this process is known as forward vertical integration. Horizontal integration is the opposite of vertical integration where instead of moving up and down the supply chain the business expands by merging or acquiring businesses like itself at the same position in the supply chain. In this example our business is a refinery and seeks to dominate its position in the supply chain by merging with or acquiring other refineries, this process is referred to as horizontal integration. By dominating a single link in the supply chain (in this case refineries) every other business within the chain (oil wells and gas stations) has to come through the business to operate. Vertical and horizontal integration refer to a process in which business growth occurs by merger or acquisition within the current industry and the business either moves up or down or across its supply chain to merge with or acquire new businesses. There is however one final method in which a business can grow and that is diversification which is sometimes referred to as conglomerate integration. Diversification refers to a process in which a business merges or acquires another business in a completely different and unrelated industry. In our example the refinery business acquires a chain of hotels. 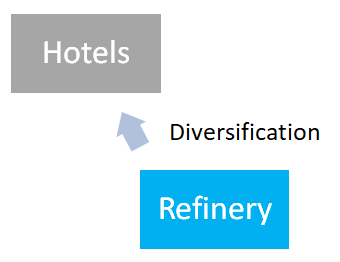 The hotel business is a completely unrelated business to the oil industry and has no position or impact on the current supply chain of the refinery business.